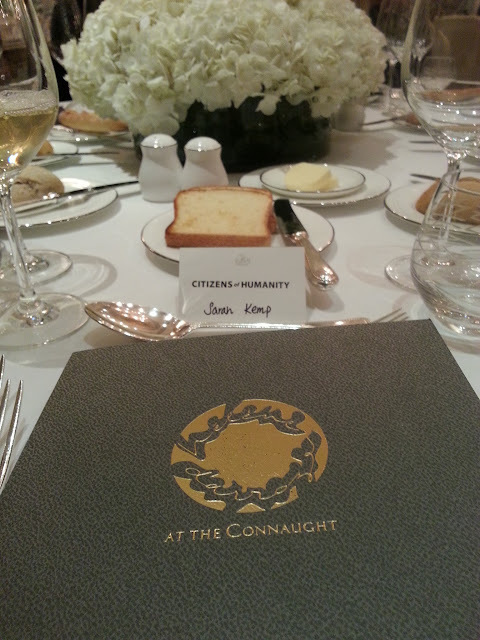 A couple of weeks ago I was invited to a VERY posh lunch at The Connaught, hosted by American denim brand, Citizens of Humanity. 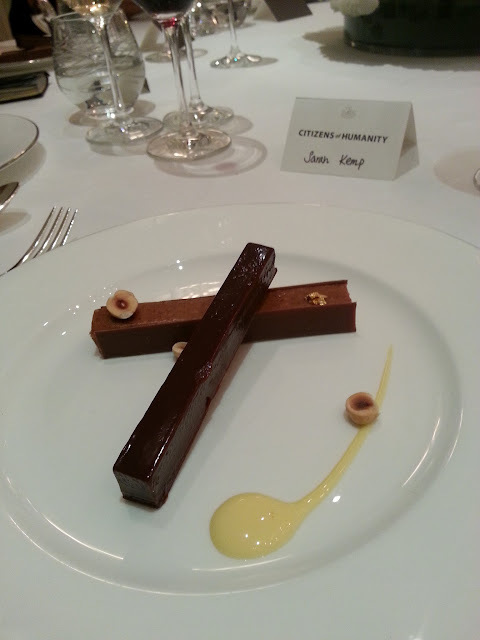 But this wasn’t any old lunch at The Connaught, this one would be hosted by Héléne Darozze herself. The Connaught is very close to my office but I knew this lunch would take up a bit more than my lunch hour so I took the day off in preparation. The eager beaver that I am, I was first to arrive to a Laurent Perrier Champagne reception and sat chatting to the team while the room filled up with guests for the lunch. I thought I wasn’t going to know anyone because it was mostly a fashion crowd, then a familiar face casually walked through the door, that of Mr. Douglas Blyde. I don’t think he saw me at first and I caught a look of surprise and nervousness on his face when he saw a room full of girls from the fashion industry. I said hello and sensed relief. We made it through to the private dining room and found that our name cards were sitting next to each other. 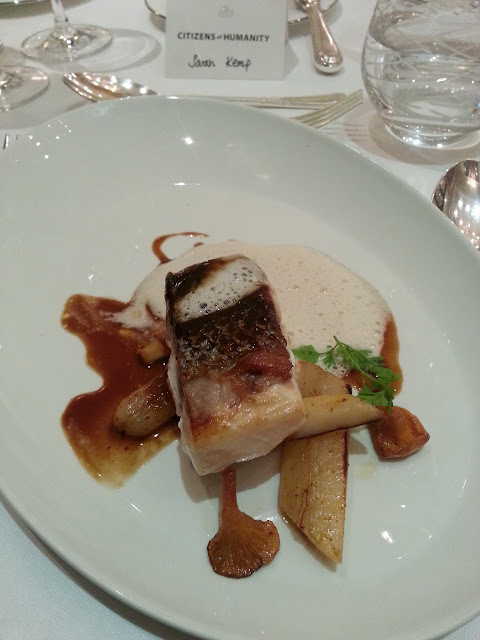 We all marveled at the beautifully decorated table and opened our menus, delighted to see what it had in store for us. I couldn’t have wished for a more enjoyable Wednesday afternoon. 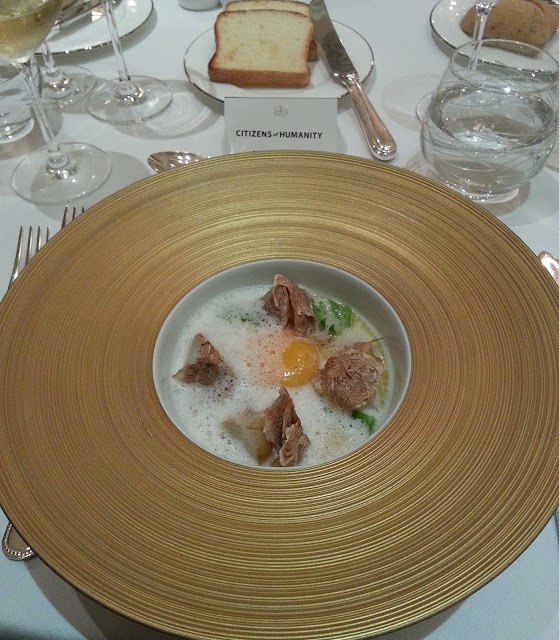 I am now itching to get back to The Connaught to try some of Héléne’s other classic dishes. I also very much look forward to receiving my complimentary pair of Citizens of Humanity jeans! I will of course post a picture when I receive them. Helene Darroze: Just Like You from Citizens of Humanity on Vimeo. What: “Just Like You” is a yearlong philanthropic film series from fashion brand Citizens of Humanity. The campaign profiles the creative journeys of two-dozen cultural leaders who inspire the brand, all of whom are participating for charities of their choice. The project was spearheaded by CITIZENS OF HUMANITY President Amy Williams and is directed by Jared Freedman, acclaimed documentary filmmaker and Creative Director of Strategic Branding for CITIZENS OF HUMANITY. Héléne Darozze: Legendary French Michelin-starred chef and restaurateur who was the inspiration for the character Colette in the Pixar animated film Ratatouille. This fourth generation chef remains inspired by authentic regional and seasonal flavors, in her film profile she says, “When you are responsible, just to give happiness to people who come to visit you, that’s pretty exciting.” Darozze is participating in support of charity Afghanistan Libre, which looks to improve psychological and social conditions for women in Afghanistan.